Further, Barr has a troubling record, including his praise of efforts to weaken civil rights protections, support for Trump’s extreme Muslim ban, and a troubling history of providing unsolicited criticisms of the Mueller investigation. Despite his previous tenure as AG, Barr is unqualified to serve this office again, particularly under this administration, and I urge you to OPPOSE his confirmation. President Trump’s nomination of William Barr to serve as Attorney General is just the latest in a string of attempts to undermine the Mueller Russia investigation and it must be stopped. As recently as 2018, Barr authored a legal memo questioning the “lawfulness” of the Mueller investigation – a clear threat to the future of the investigation and to finding out the truth of what transpired before, during, and after the 2016 presidential election. 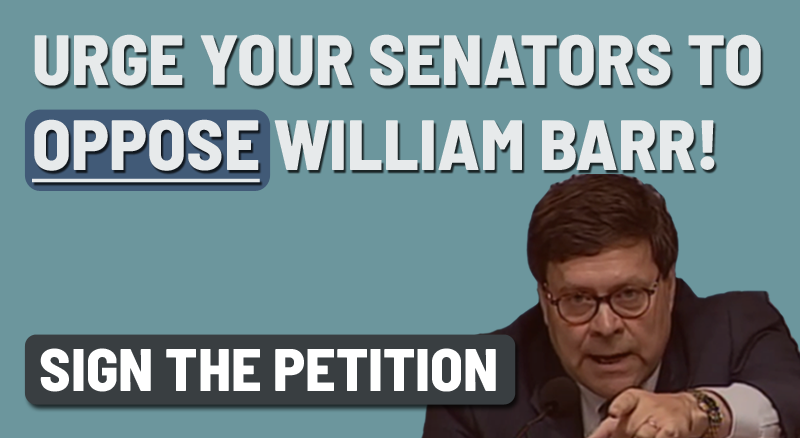 Urge your senators to OPPOSE William Barr’s nomination as AG. Trump has a clear agenda in selecting Barr and we must not allow another political lackey to fill the vacancy.